Created by the University of Science and Technology in Hefei, android Jia Jia is equipped with high intelligence as well as the ability to read and respond to signs of emotion. As interviews have shown, she also has a bit of a temperamental personality. The design of humanoid robots often embodies our ideals of human perfection. Very few places in the world would release an AI assistant in 2017, and present it like a classical maiden. Jia Jia comes with a range of Han Fu (traditional dress of the Han Chinese from around the Tang Dynasty onwards, preceding the Manchu style clothes of the Qing era). Whether it is down to the popularity of period dramas, or that a modern equivalent is yet to be found, classical beauty appears to remain an ideal in 21st century China. 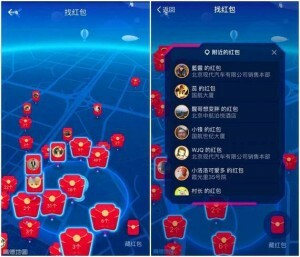 Online platforms such as QQ and Taobao are now offering digital hongbao (red envelopes) around Chinese New Year via their apps. This Spring Festival, the Changsha Evening News teamed up with tourist attractions to plant hundreds of virtual hongbao around the city, which consumers could track down and claim using the augmented reality apps on their phones. AliPay and WeChat have enabled customers to plant hongbao in specific locations anywhere in the country for their friends and families, who can then scan and retrieve the money on their end. Some things rarely change. Different technologies, same customs. The hongfengbao, popularly known as hongbao, or lishi (an older term used by the southern Chinese; ‘laisee‘ in Cantonese), is an old custom of money-gifting in red paper envelopes on felicitous occasions such as births and marriages. There’s even a minor god in the Chinese pantheon, who looks after loose change called Li Shi. The custom is most well-known in its Chinese New Year form, sometimes also adopted by employers to reward their employees. In fact, the custom’s iconic image — the bright red packets with full-colour or golden nianhua style images — was established during early to mid 20th century thanks to the introduction of mass colour printing and gold foiling. The custom has clearly once again, adapted to new technologies, via software such as apps, AR and Fintech. In 2011, results of a study by Fudan University scientists were published pertaining the discovery of an “alcohol-resistant” gene in ancient East-Asians linked to the early development of agriculture in Asian civilizations. Researchers dedicated this gene to Du Kang, the Chinese god of wine. The earliest legends of Du Kang date back to the Xia Dynasty (c. 2070-1600 BCE), and evolved through the ages as the embodiment of his spirit migrated from a quartermaster to political leader to village winemaker, weaving in mythical elements along the way. Today his name has become synonymous with 酒 (jiu, Chinese for alcohol), and is invoked by companies who want their brands to harness the powerful imagery of this symbol of the great ancient tradition of indigenous wine-making.